A Manhattan-bound F train with 1,000 riders on board derailed Friday morning in Queens, injuring at least 19 people, and firefighters had to rescue hundreds of passengers out of the subway tunnel through a sidewalk grate. Fifteen passengers had minor injuries and four were seriously hurt after the derailment near Broadway and 60th Street in Woodside, FDNY said. The tunnel was dark, hot and full of dust as emergency responders climbed down through a sidewalk grate to evacuate the train, leading people out in groups of 20. Firefighters and EMTs went into every car to talk to riders and keep them calm before the evacuation began, Deputy Assistant Chief James Leonard said. 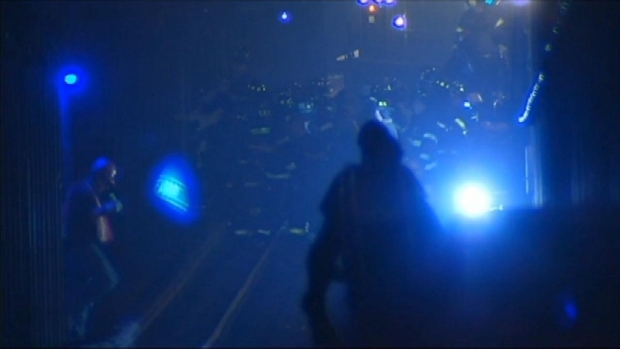 NBC 4 New York obtained underground video of firefighters responding to the derailed subway in Queens. The message was, "Listen, the Fire Department is on the scene, the NYPD is on the scene, you are safe, we will get you out of here," he said. As they guided terrified riders through the dark, emergency responders were concerned that people would become hysterical. Sheldon Dutes spoke to some of the injured passengers who were on board the train that derailed near the 65th Street Station in Queens. "It was hot for people down there. On top of that there was a substantial cloud of dust, which people could associate with smoke ... which panics people," Leonard said. The evacuation took about an hour, he said. The MTA is investigating what caused the derailment. Authorities said the first and last cars of the eight-car train stayed on the tracks while the middle six cars derailed. Some passengers told NBC 4 New York they heard screeching and banging as the train came to a sudden halt. "We heard these sounds of metal clanging," one rescued rider told NBC 4 New York. "It just stopped and no one knew what it was." One woman described the feeling of flying off the tracks as "kind of like riding a roller coaster." Another man said "the train shook really badly." The train that derailed was on the express track, but it was near a local stop at 65th Street. Officials said the track was also damaged, and it would be several days before full service could be restored. Crews were working overnight to free the derailed train and repair the track. The MTA said it was not immediately clear how fast the train was going, or what the speed limit is in that area. An E train had to be evacuated near the derailment site after authorities turned off power to the tracks, and two other trains were backed up to the nearest stops so riders could get out.